Strawberry Season is Back! Stawberry Clafoutis is back too. A few days ago I was in the produce section of my local grocery store, where I found a huge sale of locally grown Driscoll’s Strawberries at four 2-pound baskets for $5. It was a whopping steal deal, because Driscoll’s strawberries normally go for $2.99 a pound. So I snapped up four baskets as I enjoy consuming strawberries in the summer months. I like tossing them in iced cold water with mint and some Basil Seeds for a refreshing drink. I also make Strawberry Ice Cream or I just plain eat them as-is since Driscoll’s produces one of the most sweetest strawberries that I’ve ever tasted. It has been like a whole 12-months since I made that French dessert Clafoutis with strawberries. Because the opportunity presented itself, I decided to make it again to appease my desires for the illustrious strawberry. Clafoutis is a French Dessert that is usually made with Cherries. It’s a sort of custard-like dessert with some cakey edges and it’s best served warm. I quite adore the strawberry version, because the oven-warmed fresh strawberry is such a comforting taste. 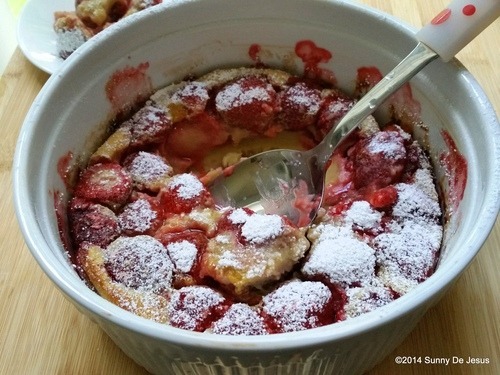 The folks at Sunset Magazine through MyRecipes.Com has a super easy recipe for Strawberry Clafoutis that I’ve used for a few years. It’s so easy that even children will have fun making it. Here it is below. I hope that you enjoy making it and eating it. 2. In a blender, whirl eggs, milk, flour, granulated sugar, vanilla, and salt 15 seconds. 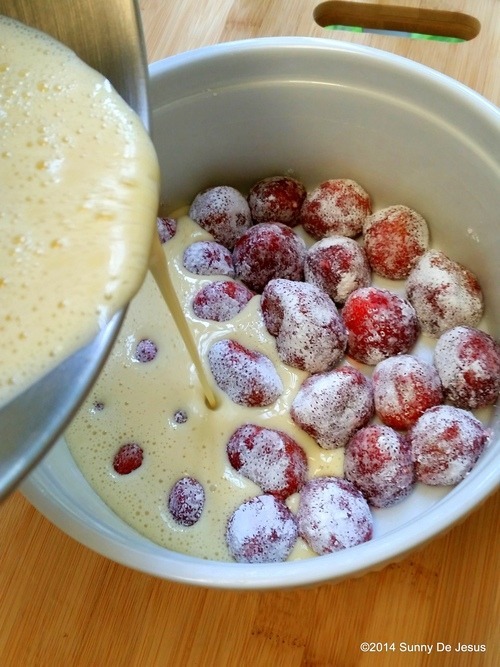 Pour batter over strawberries.